Many issues challenge boaters getting to the water – time, convenience, maintenance, insurance cost, and protection from hurricanes. That leaves a wide avenue for marina owners to differentiate themselves from the competition. For owner’s considering a new development, the challenges include entitlements, permitting, changing water levels, restricted land size, and community access concerns. One way to respond to these challenges is through a well-designed automated or semi-automated drystack marina. The benefits of traditional drystack marinas and utilizing forklifts, have made boating more convenient and cost effective for many locations. That said, there are limitations. There are substantial costs associated with forklift operation. Pollution, safety, insurance, cost of operators, damage to boats and maintenance costs associated with the new heavy-duty equipment needed to lift the larger vessels being manufactured today. Standard forklift operations today need much more real estate to lift large vessels from the water and place them in dry storage racks, but physics often prohibits them from being placed much higher than several stories in the air. Purchasing more land to accommodate the turning radius needed to move these vessels becomes a front-end cost that many of today’s marina developers cannot afford to make the project financially stable. These issues can be overcome through automation, allowing drystack marinas to be constructed on sites where it was not possible before. Through automation, vessels can now be stored much higher and on much tighter property footprints. Automated and semi-automated dry storage facilities use an internal crane system to safely retrieve, maneuver and store boats in much less space than is required by a forklift. More importantly, automated systems have much greater capability in terms of weight, boat length and access to rack height. An automated system is fully computer driven and uses sensors to move boats. This process only requires the operator to simply specify which boat is to be launched from the control panel and visually monitor the process. A semi-automated system uses the same type of crane operation and sensors, but incorporates an operator into the crane system to directly manage the process. Two stage systems use a crane to lower the boat from the rack to a transfer station, which can be designed to accommodate tidal ranges in excess of 27 feet. In either approach, the crane systems allow for the safe movement of boats in a much more confined footprint than traditional drystack facilities. A traditional forklift might be able to service racks up to three to five vessels high (requiring much smaller vessels to be placed at the top due to safety and weight considerations). This greatly reduces revenue. An automated system can service a facility more than 100 feet in height on a narrow footprint and can consistently handle boats up to 52 feet LOA and weight loads of 35,000 lbs. The speed of retrieval can also be much greater, with delivery times from rack to water consistently as fast as 4 to 5 minutes. Allowing up to 150+ moves per 10-hour day with only one crane. Additionally, multiple cranes can simultaneously increase efficiency and reduce maintenance and downtime which are part of any dry stack facility. These cycle times continue to be reduced by adding larger drives and gears to increase efficiency. It also greatly reduces risk to personnel and damage to vessels. This is a major improvement over the 4 to 10-minute cycle times associated with a standard forklift operation, and reduces damage to boats, pollution and the cost of expertly trained personnel. 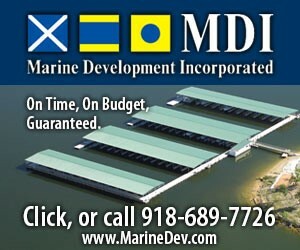 The Argentina based International Marina & Waterfront Development (IMWD) team has been involved in the design and development of several facilities, including an existing 1,400 boat marina that will soon expand to 3,000 boats, and another facility serving 6,000 boats that is under construction. 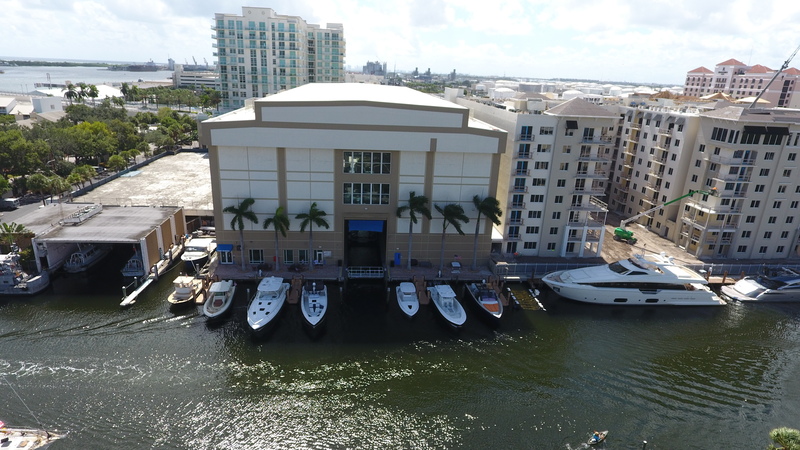 IMWD has expertise in large scale projects that incorporate individual marina modules with retail and services to support 300 to 500 boats each. These modules can be phased and added on to one another as demand warrants to expand the facility as needed. While automated systems incorporate the reliability and design principles of existing crane technologies that have been tested and proven over decades, each system is unique and designed for the specific boats to be moved, the site and building capacity. Maintenance is very easy as all the parts are standard “off the shelf” crane parts commonly found in most locations. More important, they are safer for people in the area, and much less likely to cause damage to the boats, since the systems reduce the opportunity for human error. Automated systems are comparable in initial capital cost to traditional forklift operations of the same capacity but are much more economically efficient when you take into consideration that they require fewer employees and simplicity to operate the system. They also provide much more linear feet of leasable boat storage per square foot of land area. They greatly reduce pollution and risk to the marina operator, and potential damage to boat owner’s vessel. Since there is no need to store smaller boats above larger boats, there is no lost storage on the upper levels of the facility. This maximizes the storage in the structure and provides greater revenue potential. Architecturally, automated drystack structures are much more flexible and can be located in much smaller urban sites in dense areas closer to where boaters live, such as in downtown urban locations in major cities. The exterior can be made to provide the appearance of multi-family buildings, commercial office buildings, etc., and be deigned to blend with neighborhoods, which metropolitan areas prefer for compatibility. Parking can be fully integrated within the building on lower levels, and some newer designs have included automated parking as well. Multi-stage systems can accommodate tides up to 20 feet or more. More important, as public access to the waterfront has become a requirement in nearly all urban areas, these systems allow the boats to be safely launched over a completely separate, uninterrupted public promenade that can activate the water’s edge and ease permitting and entitlement concerns. The structures can easily be designed to withstand Category 5 hurricanes, snow and earthquakes. Since they are run completely on electricity, solar banks can reduce long-term energy costs, the effects due to power outages, and the noise and exhaust emissions from forklifts. As concerns about the long-term sustainability of the industry grow, every opportunity to reduce carbon dioxide emissions becomes more important. A higher density of boats also creates a more viable financial model, allowing for higher quality materials and design features that make the building more suitable for prime urban locations where local zoning and review boards have much higher standards for approval of neighborhood compatibility. The overall efficiency and cost effectiveness of automated facilities make them ideal for high value sites in prime urban locations where traditional wet and drystack marinas could not fit or be financially viable. These locations are usually within densely populated areas, and this proximity and convenience addresses one of the biggest limiting factors in boating today – time. Building on this advantage, a new level of service can be offered to the boaters who are willing to pay for a premium experience. This begins on arrival through parking located inside the building itself, followed by entrance to a customer lounge with concierge services as the boat is launched. If desired, the boat can be fueled, pumped out, and stocked with food and beverages. Boaters can watch status monitors at all times, and at the end of the day, the boat can be washed and service performed as needed, making the boating experience more like a premium valet service. Yacht clubs and restaurants can be easily integrated into the structures, and boat club/rental services can accommodate the millennial more interested in the “sharing economy” than the hassle of boat ownership. While this approach to drystack design is still relatively new, there are a number of successful facilities around the world. Port Marina Condominium Association in Fort Lauderdale, Florida, was the first automated drystack facility in North America. A Maff-Stack, LLC automated facility, it was constructed in 2005 and all slips in this high-end condominium facility are privately owned. The speed of the original retrieval system was comparable to traditional forklift with cycle times of 10 to 20 minutes. Now operated by F3 Marinas, the system has recently been upgraded by Maff-Stack and Trutegra Controls to increase the speed of launch by 300 percent. As more marina owners have come to understand that there is excellent value in this approach, new facilities by IMWD, F3, Maff-Stack and Trutegra are currently in design and expected to break ground this year. The bottom line for the marina owner is creating and delivering a high-end marina destination in the right location, serving a customer base with a higher level of service closer to home, and it must work within the economic realities of the market. 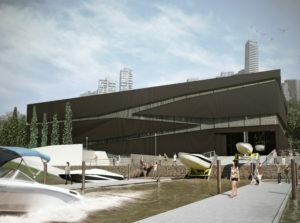 Getting a project built on a challenging, high-value site requires a higher level of architectural quality, greater attention to the integration of public access to the waterfront, a deeper understanding and response to environmental concerns, and a highly efficient structure that accommodates the greatest density of boat storage given the land available. The bottom line for today’s boater is convenience and service, and they want their boating experience to be easy and maintenance free. If they can get to the boat within ten minutes of home or the office rather than an hour’s drive, they’re much more likely to go boating and keep on boating for life.